Oh the lovely things: Spotlight : Depeapa - and a Giveaway! Spotlight : Depeapa - and a Giveaway! The winner from Marchare's giveaway has been picked by a random number generator and it is Lilly! Congrats Lilly! Thank you so much to all of you for playing along! I wish I could have a prize for everyone of you. But you can try your luck at the new wonderful giveaway I have for you today! I recently discovered depeapa's work and I really love everything she makes. Her art is so pretty and beautifully quirky! I fell under the unique charm of her shop, where she sells super lovely pocket mirrors, tote bags and backpacks, and porcelain, wood and felt brooches and necklaces, and more. Verónica, the lovely person behind depeapa, is a very talented illustrator living in Granada (Spain). I love the sketchiness, the uniqueness and the storybookness of her style. Depeapa is giving away the tote bag or backpack of your choice! You can just pick your favorite! See how to enter at the bottom of this post. This giveaway is now closed. Thank you so much for playing along! Enter to win your favorite bag or backpack from Depeapa! Please note : You are free to use as many (up to 6) or as few different entries as you want. If you use more than one entry, please leave a seperate comment for each entry. If you win, we will need to contact you, so please make sure to leave your email address or any way to be contacted. This giveaway is open to all (worldwide). Visit Depeapa's shop and leave a comment letting us know which item is your favorite. Giveaway ends on Sunday, July 31st 2011 at 11:59pm EST time, and the winner will be randomly chosen using a random number generator. Best of luck to you all! I love the bear and flower screen printed canvas backpack totes! I've been loving this shop! I can't believe you're hosting the giveaway with Depeapa's item! I love "Flowers - screen printed canvas Tote bag" soo much! I liked Depeapa on Facebook. I posted about Depeapa on my Facebook! I read it every everyday! love the bearded tote! so cute!! I'm a follower of Oh the Lovely Things! i love the flowers canvas backpack! Omg these items are so lovely!! thanks for this giveaway! I love her liberty flowers necklace! I like Depeapa on FB. Of course, I already follow your blog! The bearded man tote is super cute. i liked depeeapa on facebook! I "Like" Depeapa on Facebook! I like the Geometric Mountain Tote! I like the screen print flower bag! I like Depeapa on Facebook. I follow your site via GFC! I follow ohthelovelythings with GFC. I visited her shop and have to say, it is difficult to choose, but If I HAD too, I am dying for the bearded tote. Sooooo cute! I liked, Depeapa on FB. Although its really more like love! FB posted about it too! I'm also having a giveaway for $100. Hope you come check it out! I like the Flowers - screen printed canvas backpack tote! I like Depeapa on facebook! Katy A.
I like the Fox - color handcrafted and illustrated brooch felt. I like her on FB (Suzanne G). Yay, giveaway! :) i love the Geometric mountain tot. I love the geometric mountain bags! My favourite item was the Girl and house - illustrated wooden necklace. Love it!! The bags are amazing! I think that bear one is my fave :) Or the flowers. Love the Flowers - screen printed canvas backpack tote!! My favorite is the girl with the bun pocket mirror. I love the shoes illustrated on the wooden piece! Following on google friend connect as simplefragments! 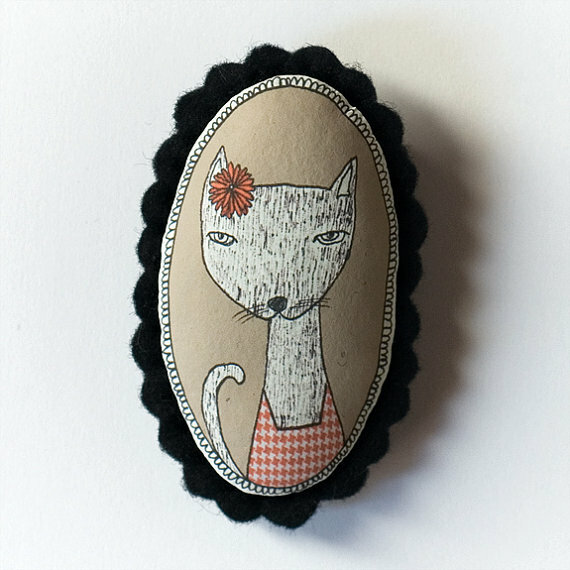 I love the Dog - b&w handcrafted and illustrated brooch felt--it reminds me of my dog! 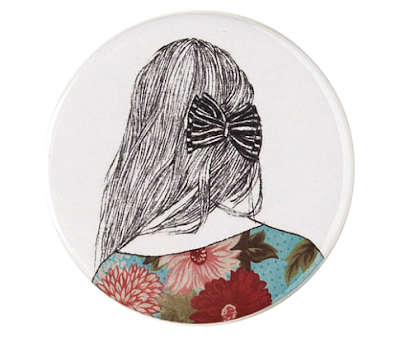 I absolutely love the Circles- illustrated wooden brooch! I like the Geometric Mountain Tote Bag-great pattern. The liberty flowers necklace is really pretty. What a whimsical shop, I love the style of the illustrations. My favorite is the Flowers - screen printed canvas Tote bag, I love the flower motif. Thanks! My favorite item is the "Rooster - color handcrafted and illustrated brooch." It's so cute! Thanks for introducing this cute shop! 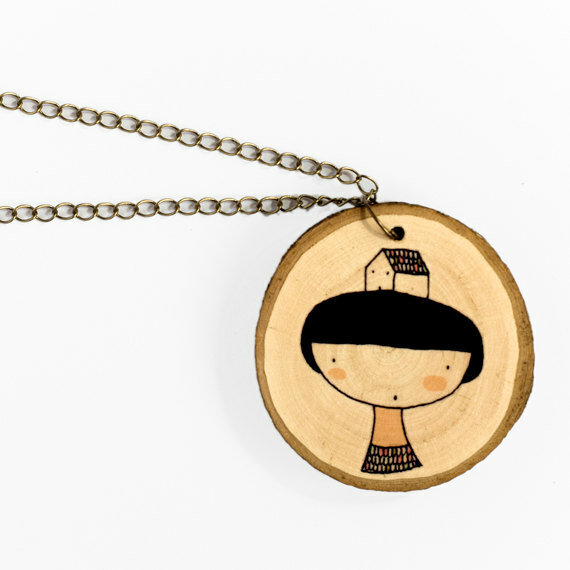 I like the Girl with House wooden necklace, this is such a fun piece. Follow with gfc, thanks for the lovely giveaway. Wonderful Shop! I love the Flowers Screen Printed Canvas Tote Bag from Depeapa's Etsy shop. I love the panda backpack tote!! I love the "Flowers - screen printed canvas Tote bag"! I follow you via GFC as "Liz"! liked them on fb under Karlene S.
My favorite is the Flowers - screen printed canvas Tote bag. I love all the felt broochs! The duck is very funny!! and the dog too!! I also like the Girl Pocket Mirror. hi! recently found depeapa's shop and loved how cute it was, so glad i found this giveaway! i love the flowers tote:) liked depeapa on facebook too! Oh, and I'm already a follower of your blog! 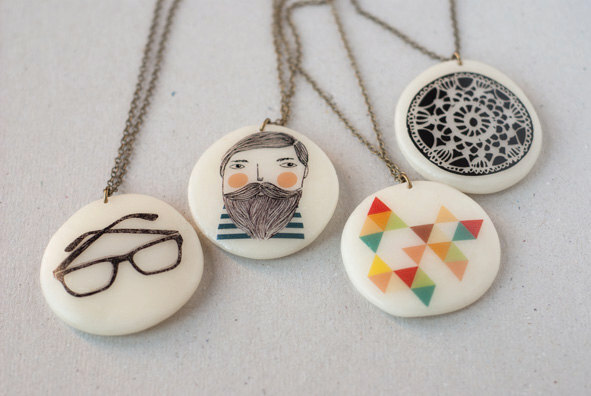 My favorite is the Mustache - illustrated wooden necklace. I really like the Flower Backpack, but would prefer it as the tote bag (I just did not see one available in the shop). 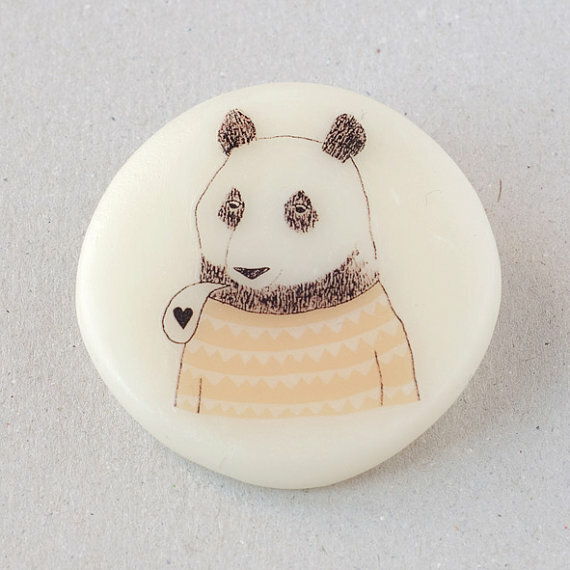 i couldn't find the handmade porcelain on the shop, so i'll have to say that my favourite between the items there is the moustache illustrated wooden necklace! i simply love it! i'm elle and my email is andnowitslight at gmail dot com! I think I am a little bit in love with the geometric mountain tote. So gorgeous! If I am lucky enough to win my email address is on my webpage listed. I love the Flowers - screen printed canvas Tote bag! So so cute. I love all the canvas totes, but if I had a Bear screen printed canvas Tote, my boyfriend would be totally jealous. Fan on FB as Kirsi T.
I love the flowers tote bag. I Like Depeapa on Facebook! 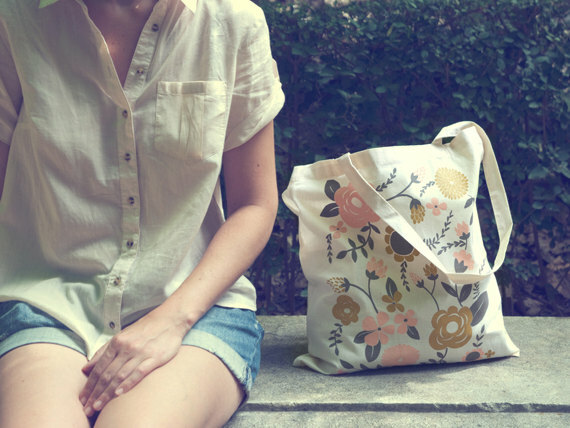 I love love love the Flowers - screen printed canvas Tote bag that you showed! It's so cute and pretty! I became a follower on gfc. I like the boy speaking-illustrated wooden brooch. I like the red shoes illustrated brooch! I love the Flowers - screen printed canvas backpack tote! I love the screen printed flower tote! I love love love the red shoes illustrated wooden necklace! I love the flower tote! Flowers - screen printed canvas backpack tote is my favorite. My favorite item is the canvas backpack in Flowers. It's so hip! I liked Depeapa on Facebook as Lydia Parker. I also am now (finally!) following your blog. I'm on the mailing list with my gmail account, lydia.h.parker@gmail.com. Geometric mountain - screen printed canvas Tote bag IS BEAUTIFUL MY DEAR!!! Flowers - screen printed canvas Tote bag!!!!! ALSO DARLING!!! Verónica has such a wonderful talent! I've just featured her work in an article for my blog, Mint Style Studio:) I can't decide between the pretty flowers or the charming sailor! Ooh! I just love that panda tote bag! The rest of the shop is amazing too but the panda tote has my heart! Thank you for this, I love those totes! I liked Depeapa on Facebook, I am Giovanna V. on FB. Love the geometric mountain tote! Oh I am already a follower! My favorite is the Flowers tote but my daughter would love the bear tote!